Charge two iPad tablets simultaneously, in your car. The Lightning Car Charger features one 2.1A Lightning port and one 2.1A USB charge port and works with any standard car AUX power outlet, enabling you to charge two mobile devices simultaneously while you're on the road. The attached Lightning cable allows you to charge any Lightning-equipped Apple mobile digital device (iPhone, iPad, iPod). The USB 2.0 port gives you the option of charging an additional Apple device through either a second Lightning Cable or a 30-pin Dock Cable. 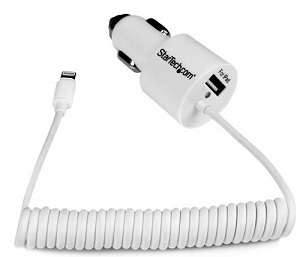 Or, you can charge a Micro USB or Mini USB-enabled mobile device, such as a Smartphone, Tablet, GPS, etc. using a Mini/Micro USB Cable. No matter what you choose to charge, you can always be sure you have the correct charge available for all your mobile devices. Having the ability to charge two devices simultaneously means you and your passenger are always fully charged and ready go. Plus, your passenger can charge and text, work or game while their device is charging. This durable car charger is Apple MFi certified and backed by StarTech.com's 2-year Warranty to ensure dependable performance.